Publish/Subscribe (PubSub) is an established communication paradigm where senders do not communicate information directly to the intended receivers but rely instead on a service that mediates the relationship between senders and receivers. Specifically senders (called Publishers) post information to and receivers (called Subscribers) declare their interest in specific information to a Service. 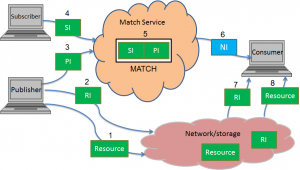 Here the mediator service is called Match Service Provider (MSP). It should be noted that “Publisher” is not necessarily a user who distributes media to end users and “Subscriber” is not necessarily synonymous with end user or consumer. Indeed Publisher may represent a user who has created a media item and wants to make it available to publishers and Subscriber may represent a publisher who is looking for media to be distributed. Therefore Publisher could very well be a creator who announces the availability of his latest work and Subscriber could be a publisher who is looking for new works to publish. A typical steps of a Publish/Subscribe workflow in a media distribution context are given in the table below, where “Resource” is the media item that is announced (i.e. published) by Publisher and will be eventually consumed by a Consumer. Note that steps 2 and 3 may also happen in reverse order, i.e. a Subscriber can look for information before the information is actually published. In other words there is no specified order for Publications and Subscriptions to be made. Access the Resource present in or referenced by the Resource Information (RI). PSAF does not specify the protocols used to carry these payloads. NB: Consumer is the user receiving NIs. It may or may not coincide with Subscriber or Publisher. CEDEO has developed the main contributions t the PSAF standard and implemented PSAF in the context of the European FP7 project GreenICN, where it has developed WimICN, a video distribution platform for ICN depicted by Figure 1. 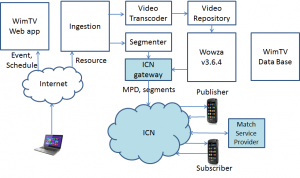 WimICN supports two forms of video services: on demand and live. The latter takes two forms: a normal live event and a scheduled event that is a combination of on demand videos and live events. Video upload and live event/scheduled program creation are performed by WimTV (the white blocks in the figure above), while PubSub, and the put/get of MPD and segments to/from ICN are performed by the other GreenICN system components (the light blue boxes in the figure above). User devices are mobile handsets running the WimCom (ccnx) and WimPeer (publication-subscription-consumption) on Android. When a Publisher selects one of the videos that he has previously ingested to ICN from his private area (called WimBox), the Segmenter creates DASH MPD and segments and sends them to the ICN Gateway for storage to ICN. The PubSub Application receives the MPD on the Publisher’s ICN PubSub channel and creates RI and PI using other metadata provided by Publisher. When a Publisher selects one of the live or scheduled programs that he has previously created from his private list, WimTV sends the Publisher information regarding the live event or scheduled programs. The PubSub Application creates RI and PI using other metadata provided by Publisher.